Host your music on Wazala - We offer many subscription plans with different hosting for digital file size that may work for you. Host on SoundCloud: You would need to insert the URL of your downloadable tracks to Wazala, and once a purchase is made we will mask that URL and send it to the customer to download. You can easily import your SoundCloud library and sell these as digital products within Wazala. 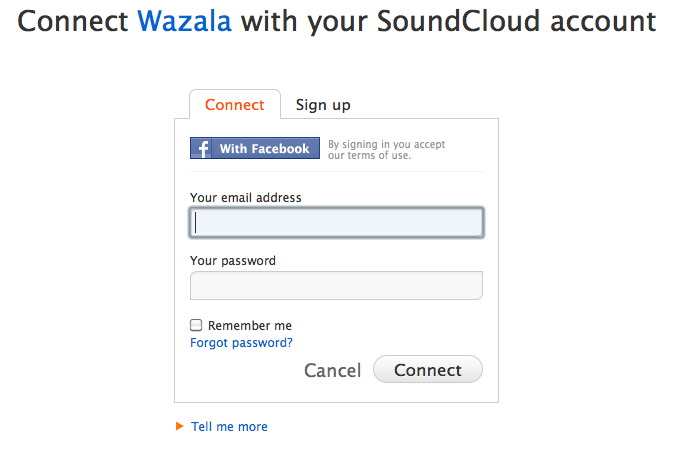 You will be asked to allow Wazala access to your SoundCloud account. Once you allow Wazala access, your tracks and sets will be listed. Here you can choose which sets to import as a single product with tracks sold within this single products - like a CD - or import single tracks each as it's own product for sale. State the price and if you wish to make them active. Wazala can also import the genres as categories. The import will start once you confirm. Depending on the size of your files, this should not take long. Once the import is complete click on Done, and you will be able to see your tracks listed as products for sale. Customers will as usual, be able to preview the song, and once purchased the delivery is automated and secure through a masked Wazala URL. 1. Add a Wazala "Buy Now" link to my SoundCloud tracks. If you choose this option, Wazala will automatically add a "Buy This" button In SoundCloud. SoundCloud allows you to do this manually too, and we will cover it below if you choose not to allow Wazala do it automatically. 2. Import genres as categories. This will help you categorize your genres so your customers can search for rock, pop etc and find what they are looking for. This will allow you to tell Wazala where your songs are hosted. When a customer buys them they will be delivered a masked link and can download them directly via a server to server communication of Wazala and SoundCloud. Login into SoundCloud and get the secure URL of the track or set. Making sure they are set to downloadable. Login into Wazala and go to Manager > Products. Click on NEW to create a new product, or edit a pre-existing product. In the download section, insert the URL instead of uploading a file. If you're selling a CD with multiple singles then you would need to insert each single track URL into one of the ADD boxes you see in the picture below. Once you add all the singles you have the option to add a bundle link. This will be for the purchase of the full CD and needs to be the URL of the set in your SoundCloud account containing these tracks only. If this is a bundle (full CD) then you need to give a .zip file of the entire CD. You can add the "Buy This" button on SoundCloud by simply getting the product URL and placing it into the track or set edit page within SoundCloud. 1. Get your product URL from Wazala - If this is from yourstorename.wazala.com then simply copy the product URL from any browser. If you have the widget on your website then you need to get the widget call to open to a specific product. 2. Login into SoundCloud, click on a track or set and edit it. 4. There you will find an area for a "Buy Link" Simply place your URL there and save.